One of my goals is to help people and businesses solve their problems. It could be a homeowner with a failing gutter system or, in this case, a Fortune 500 company with a package sortation conveyor problem. Package sortation conveyor what, you ask? Helping solve problems is why businesses exist, right? It seems like that is a pretty obvious goal, but I’m not so sure. In this industry, I am fairly convinced the goal of many contractors is to lookout for themselves — number 1 — and the customer is somewhere down the list. In other words, the customer is a means to an end rather than the primary focus of their everyday work. Maybe I have it backwards. Maybe I should look out for myself first, and worry less about the issues of my customers. For the purpose of this article, I’m going to focus on how we work with our customers to solve their problems. Personally, I think this is pretty cool because it is so outside the realm of our everyday work; it has helped two really big companies solve one really important problem by keeping workers safe. In 2016, I received a phone call from an Illinois area code. The guy on the other end of the phone asked me if I’d be willing to look at a job for one of his clients near the Columbus Airport. I was instructed to reach out to a guy who worked at a warehouse for a national retailer. I arrived at a series of really large, nondescript warehouse buildings that ran along the edge of the airport’s runway. The buildings were positioned in a similar fashion to a strip mall, but on a much grander scale. The only distinguishing feature was that each building was marked with a street number on its facade. I found a parking space in the expansive, but crowded, parking lot, in front of this massive warehouse, walked several hundred yards to an entry door, and asked the guard if I was at the right place. I signed in, got a visitor’s badge, and waited. Ten or 15 minutes later, I was greeted by a guy named Mike. I thought we would head outside to look at an issue on the exterior of the building. Instead, he walked me inside through the double doors and invited me to jump on onto a golf cart. Away we went, speeding down a really long aisle, honking anytime we came to an intersection of one of the many rows of shelving where product was stacked from floor to ceiling. Mike said that it’s the e-commerce division for a Columbus-based retailer. I can’t remember his exact response, but he told me that it was either 600,000 or 800,000 square feet. A typical indoor mall is about 1 million square feet, and it’s comprised of many individual stores. This was one big expansive space, for one company, under one roof. We finally arrived at our destination, and in front of of us was a package sortation conveyor that roughly resembled a millipede. It was elevated. Probably 8 to 10 feet off the ground. Down the middle was a metal conveyor belt and off of it branched a series of ramps that lead to ground level. 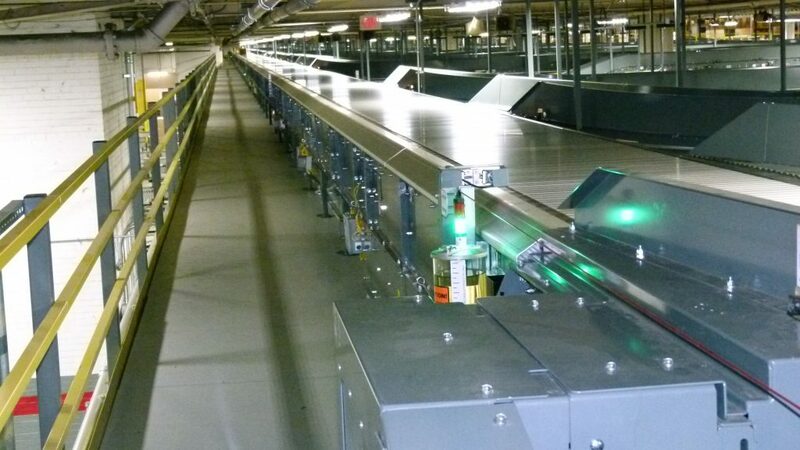 The ramps accept packages on one side and distribute them into waiting trucks on the other side. The sortation conveyor line was huge. From where I was standing at one end, I could barely see the other end. “Over 600 feet,” Mike said. “Wow,” I muttered. I had never seen anything like this before in person. And certainly not that long. I still didn’t understand why I was there. Remember, I received a phone call from a guy in Chicago who said he had a client in Columbus who had a problem that they need solved. He directed me up a number of open metal stairs to a platform that runs the entire length of the sortation conveyor. He stopped me and said the metal conveyor belt moves with a chain; the chain is lubricated with oil, and the oil drips from the chain to the ground, causing a slip hazard for their warehouse workers. “We need to solve that problem,” he said. Ahh. My lightbulb turned on. I’m standing the starting line of an elevated sortation conveyor that is designed to move thousands of packages per hour from warehouse shelving racks onto dozens of 53-foot long semi-trailers parked out back. You’ve seen those places along highways and byways. Really big warehouses, with trailer after trailer backed up to the loading docks. Underneath the sorter, tens of workers were scurrying about on foot, pushing walkies, driving forklifts and golf carts, and oil is dripping from the chain of this 2-football-field-long sorter conveyor system to the polished concrete floor below. It’s not only a problem for the workers below, it’s a liability problem for the company because they have an obligation to protect their workers. 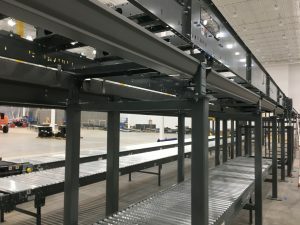 It’s also problem for the company that designed and installed the sorter because, not only were they hired to provide a turnkey solution that will help the warehouse operate more efficiently, but they also need to keep their client’s employees safe from slipping and falling due to oil dripping off the chain of the machine that they designed and installed. In other words, nobody wants to solve one problem only to create another problem. That’s why we got the call. Mike and I got to business. He showed me the specific issues and we talked about some ideas. Once I had enough information, I told him that I would come up with a solution and get back with him. Down the steps we went, back onto the golf cart I climbed, down a different aisle we drove — horn honking at every intersection — he dropped me off at the entry doors. I returned my visitor’s badge, signed out, and walked across the blacktop to my car. I returned to my office, looked over my notes and photographs I took on my iPhone from the meeting, and went about designing a bracket that could solve their problem. My solution to both companies problem was to hang a gutter below the motor driven roller chain that controls sortation conveyor belt. All the brackets on the market are designed to secure the gutter into something — typically a wood fascia board. This was different. I needed to design a bracket that would suspend the gutter in air, allowing it to collect oil drippings, while being easily accessible by maintenance personnel to clean out as needed. I enlisted the support of a local metal fabricator. The owner agreed to meet with me. I met him at his shop. 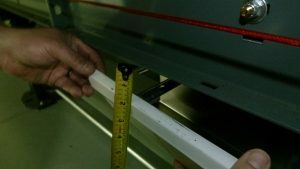 I brought my sketches, photos from my meeting, and a section of gutter so he could get the proper measurements. I explained to him the problem I was trying to solve and how I wanted to go about solving it. About a week later, he faxed me detailed drawings — yes, faxes are apparently still used — with specific measurements, and gave me a cost for each bracket. I returned to the customer and said that we could solve the problem and presented him with our proposal to get it done. He was pretty stoked. He thanked me and said that he would meet with his boss and get back with me. I helped solve their problem, and my estimate to take care of this issue once-and-for-all wasn’t even a rounding error on this multi-million dollar sorting system. I followed up a few times, and then, as they say, crickets. I had made multiple trips to this facility to check and recheck my measurements; I designed a bracket, got pricing on having it fabricated, and presented my solution to fix their liability problem. “Outside of Philadelphia,” he said. I told him it’s one thing to drive an hour or two or even five for a job. It’s another thing to drive nearly 10 hours — one way — to a job site, but if they were willing to pay a premium, I was willing to quote the job. The long and short of it was that we got the job. Sight unseen, working from CAD drawings, I fabricated hundreds of brackets, loaded hundreds of feet of gutter into my van and drove hundreds of miles to the job site. And we got the job done! And it looked awesome, and it solved a problem, and my client was happy, and their client was happy. If you have a problem with your gutters or with oil dripping from your package sorting equipment, reach out. And, odds are, we can help! Next story What is the best gutter guard for my home?